Susanna George Raju, Keith Moshe Sarkar, Chandni Babunu and Chantal Sharma of School of Legal Studies, CMR University Bangalore qualified the India rounds of the 4th Prof N R Madhava Menon SAARC Law Mooting Competition 2018-2019 held at Lloyd Law College, Noida between the 26th to the 28th of October, 2018. The moot problem was based on covert operations and collection and use of DNA is resolving crime and disaster victim identification and the rounds that were spread across two days were judged by a panel of 3 judges that included an academician, an advocate and an authority of law with respect to the subject matter. 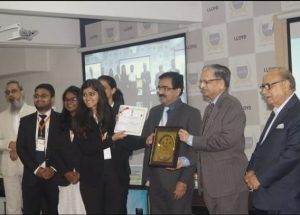 The team was ranked 5th out of the 52 participating teams and will represent the country in the international rounds that are scheduled to be held in Llyod Law College, Noida between the 15th to the 18th of February 2019. Susanna George Raju also procured the Sourjeet Basu Ray Best Mooter Award for being the best oralist (out of 104?) of the India rounds.